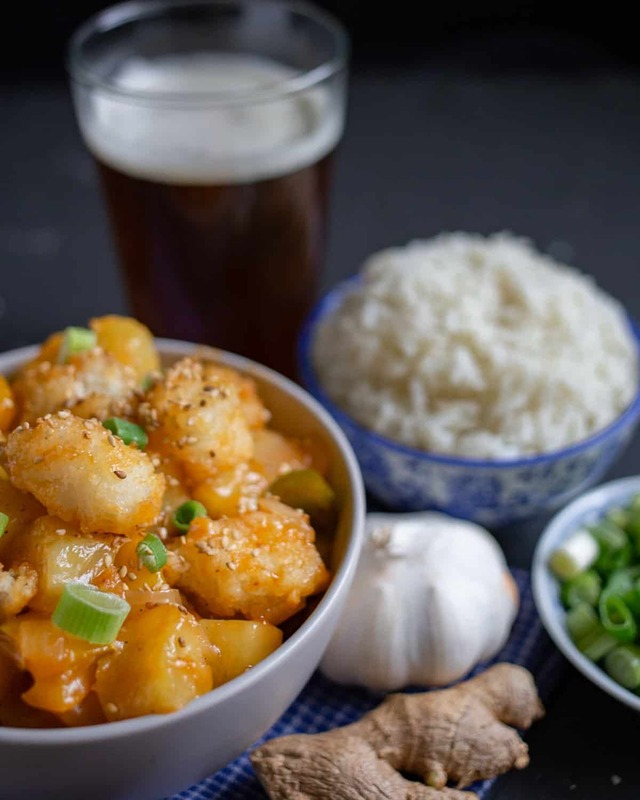 A simple recipe for Chinese sweet and sour fish: Flaky pieces of cod served with a classic sweet and sour sauce and stir-fried onions, bell peppers, and pineapples. Meals at restaurants in China are usually served family style with a large glass turntable in the middle of a round table to make it easy to share the food. When out at a restaurant with friends, the waitress would stop by the table to take the order and we would throw out suggestions until we had more than enough food for the group. With my group of friends, if you were quick with suggestions you would likely get to eat your favorite dishes. My first request at all of these meals was sweet and sour fish (糖醋鱼 táng cù yú). It would come out as a whole fish, bones, head, and all, battered and deep fried with a flavorful, complex, sweet and tangy sauce. 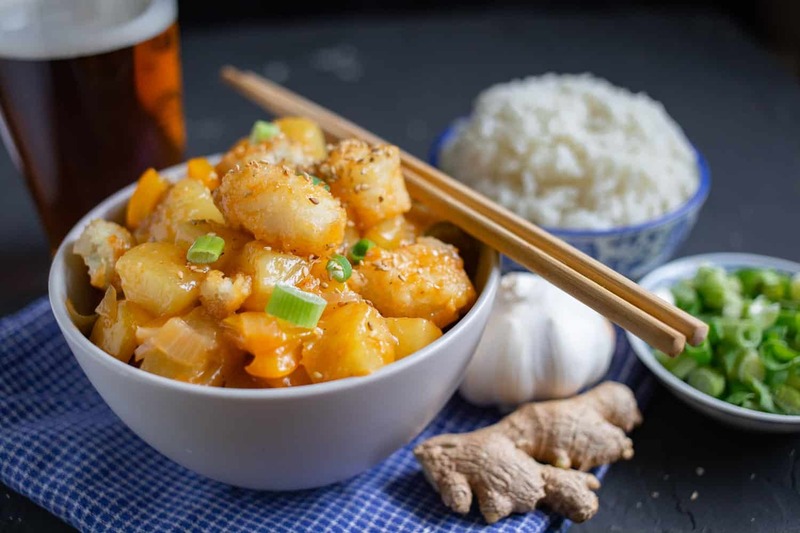 This recipe is my recreation of those flavors using boneless fish and pan-frying the fish rather than deep frying to make it a recipe to enjoy at home, not just an indulgence for a restaurant. It doesn’t take too long to cook all of the components of this dish, so start by prepping all of your ingredients. Cut the cod into 1/2- to 1-inch chunks. I have used both fresh cod and frozen cod that was completely thawed for this recipe. The texture of the fresh cod was slightly better, but the frozen cod still worked well. Place the cod on a paper towel to capture any excess moisture. Dice the onion, cut the bell peppers into chunks, and mince the garlic and ginger. Finally, drain the pineapple chunks, making sure to reserve the pineapple juice for the sauce. Then make the sauce by mixing together the reserved pineapple juice with cornstarch in a small saucepan. Use a fork or whisk to make sure it’s smooth. Add the ketchup, sherry, rice vinegar, soy sauce, and brown sugar to the saucepan and heat over medium heat until it comes to a boil and thickens. Stir occasionally. Remove from heat and set aside. While the sauce is cooking, start on the vegetables. Add a tablespoon of oil to a large nonstick skillet and heat over medium heat. Add the garlic and ginger and cook for about 30 seconds, then add the onion and cook for four minutes. Add the bell peppers to the pan, cook for another four minutes, then add the pineapple chunks, increase the heat to medium-high, and cook for three more minutes. Move the mixture to a bowl and wipe out the skillet with a paper towel. Place the skillet back on the burner over medium heat and add the remaining tablespoon of oil. Pat the fish dry one more time, sprinkle with salt and place it in the pan in a single layer. Cook for about four minutes on each side until cooked through. Remove the fish from the pan and put on a plate. Wipe the skillet out again with a paper towel. Put the skillet back on the burner over medium heat and add the onion, pepper, and pineapple mixture. Pour the sweet and sour sauce into the skillet and heat for a minute or two until warmed up. Add the fish and mix gently to coat the fish with sauce but avoid breaking up the fish pieces. Serve with rice. For a full Chinese, family style meal, make some Sichuan eggplant or ginger scallion noodles. 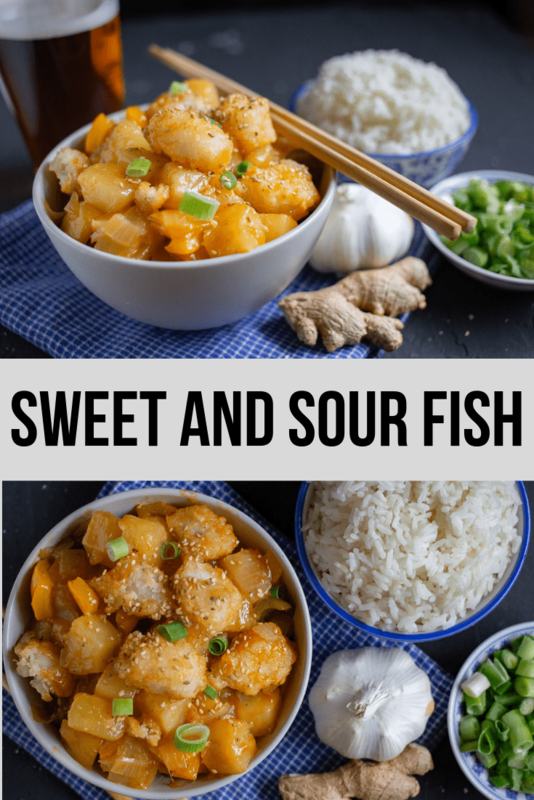 Leave a comment and review below if you try this sweet and sour fish recipe and let me know what you think! Cut the fish into 1/2- to 1-inch chunks. Place on a paper towel to dry and set aside. Dice the onion and cut the bell peppers in chunks. Mince the garlic and ginger. Drain the pineapple chunks, reserving the pineapple juice for the sauce. In a small saucepan mix together the pineapple juice and cornstarch with a fork or whisk until smooth. Add the remaining sauce ingredients (ketchup, sherry, rice vinegar, soy sauce, and brown sugar) and heat over medium heat until it comes to a boil and thickens. Remove from heat and set aside. Add 1 tablespoon peanut or vegetable oil to a large nonstick skillet and heat over medium heat. Add the garlic and ginger and cook for about 30 seconds, then add the onion and cook for 4 minutes, stirring occasionally. Add the bell peppers to the skillet and cook for 4 more minutes. Then add the pineapple chunks, increase the heat to medium-high, and cook for 3 minutes. Remove the skillet from the burner and transfer the mixture to a bowl. Wipe the skillet out with a paper towel and place back on the burner over medium heat with the remaining tablespoon of peanut or vegetable oil. Pat the fish dry with a paper towel, sprinkle the fish with salt, and place in the skillet in a single layer. Cook for about 4 minutes on each side until cooked through. Remove the fish from the skillet and transfer to a plate. Wipe the skillet out with a paper towel and place back on the burner over medium heat. Add the onion, pepper and pineapple mixture back to the skillet. Add the sweet and sour sauce and cook for a minute or two until heated through. Add the fish and mix gently to coat the fish with sauce but to avoid breaking up the fish pieces. Serve with rice. Okay, that crunchy fish with the sauce … this sounds absolutely amazing! 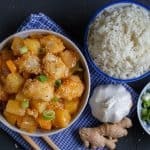 I love sweet and sour sauce but have absolutely never thought to try it with fish – now I can’t get the idea out of my mind! Pinning this to try ASAP! Looks so delicious and tempting! Such a great idea for kids too! 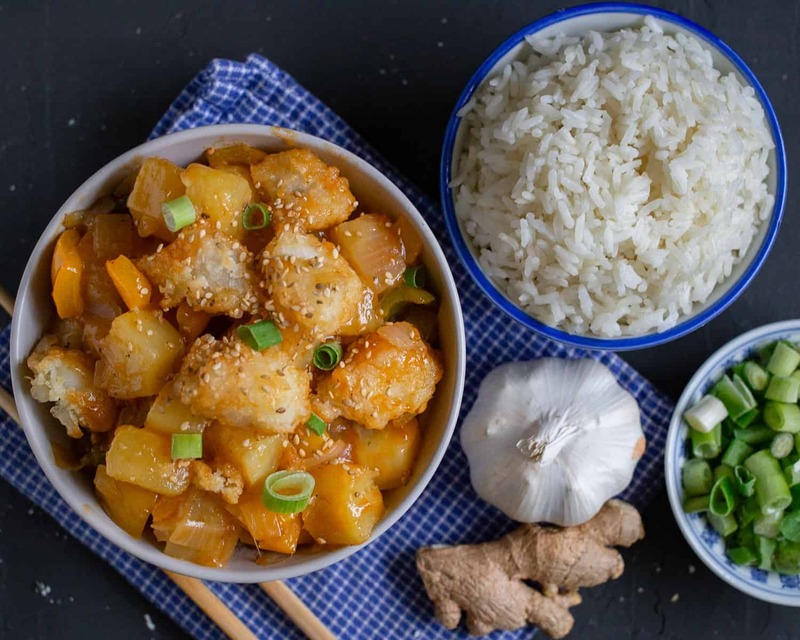 I’ve had sweet and sour veggies and chicken but never fish – this sounds so delicious! A delicious meal after a long day! Sweet and sour sauce is a keeper.. I’m going to try them with some tofu. I’ve had sweet and sour pork and chicken but never fish! This sounds so good! I really want to try it! WOW! What a great recipe. I have tried sweet and sour pork before but never fish. This makes me want to eat that whole bowl right now. I look forward to trying this recipe!